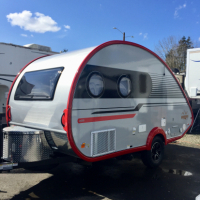 Another newbie to the small camper world - thinking of purchasing a 400 to tow with my older 2007 Tacoma. Am wondering if folks tow their 400 with smaller trucks or SUVs and how it handles and/or problems. Thank you! 2015 Tacoma, V6, transmission and oil coolers, factory tow package. I would not tow with a Tacoma without the above specs because you will be ruining your Tacoma. I get no bounce, no swaying, semi trucks really don’t push me around as they pass me as they did with my 320.. I have not tried tall mountains, only smaller mountains and I do need to get better at looking ahead and anticipating the extra effort required to go up mountains. Gas mileage.....I choose to tow at 55 mph to 60 mph for economic reasons, and that being +2 or more mpg than driving at 65 mpg. 9.9 mpg heading north with a 25 mph wind, while traveling 55 mph to 60 mph last week. The best Gas mileage I have gotten was 11 mpg to 12 mpg going 55 to 60 mph on a flat 4 lane federal highway. 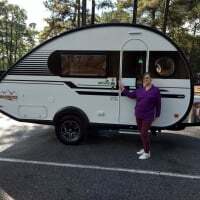 I do have approximately 5,000 miles of towing since I purchased my 2019 [email protected] 400 Boondock Lite in July. I love my 400 and my Tacoma, and I hope to still own have both in 6 years as that is when the Tacoma should still be good at 10 years old, but maybe I’ll be ready for a new vehicle. The 400, my full time home, should last many years past that. We pull with a 2016 Nissan Frontier CC, 4.0 V6. The Mileage varies but mostly in the 11 to 13 mpg area. Usually run in 4 th (ATM) which is about 62 mpg at 2200 RPM. Have pulled in windy and up and down moderate hills , mts. The frontier handles it well and we like the size for us. We pulled a 2013 320 MaXX Q before with this same rig and I believe the 400 actually pulls easier. The longer cabin gives better air flow. We have a ARE MX cap on the bed and it is kicked up and it aids the air flow. I have not noticed any need for extra trans coolers and the engine temp maintains steady. I did add a set of Timbren SES springs for added support in the back of the truck. Love the rear mounted camera on the truck and it makes hitching up a lot easier. As @Verna pointed out, the issue is your specific configuration. If you could post what engine (4 vs 6), drivetrain (2 vs 4WD), body cab style (regular, extended, crew) and the payload capacity data from the yellow sticker on the drivers side door. This type of info is important because a 4-cyl in 2007 was rated at 3500# while the 6-cyl was rated up to 6500#. All depends on your options and configuration. As to the advice on the transmission cooler, we added one to our 2013 4-Runner and it only cost $300 installed so if yours doesn't already have that, adding it isn't a problem. One of the things I still need to do is put the TAB400 onto CAT scales and get an accurate wet & loaded measurement so I can only offer you the factory specs. Factory says that dry it is 2690# curb weight which really means empty. You add water, supplies and tank loads to a max of 3500#. The hitch/tongue weight range is between 400# and 460#. The bigger your tow vehicle within reason, the better your experience will be IMO. Assuming you don't mind a bigger rig due to limitations of city living, parking, etc.. I know a truck driver who gets 10 MPG with a new Freightliner semi with 53 foot trailer loaded up to 80,000 pounds, a little overkill for a Tab, LOL, point is a bigger vehicle will likely give you better tow MPG than a smaller one that is worked to the max and your drive-train life should be substantially longer. I towed my 400 with a Nissan Frontier Quad cab v6 with no problems. I did use clamp on towing mirrors. I upgraded to a Ram 1500 because it had a larger gas tank so I could tow further between fillups and no longer need towing mirtors. I got about 10 mpg towing with the Nissan, 12-14 with the Ram hemi. Thanks to all for the great, detailed comments and suggestions! Very helpful to a newbie, as well as the link to general towing guidelines. My 2007 Tacoma is in fact a V6 with the 6500# towing package and 1200# payload. From your responses, and since this 12 year old vehicle doesn’t have too many miles on it (just over 100k), am feeling better about starting with this vehicle before looking for something bigger. Good suggestions on possible transmission cooler and/springs upgrades. Thank you! I tow my 400 with a GMC Canyon 4 cly. diesel with exhaust brakes! What kind of speeds are you usually towing at on flat terrain? Is your GMC 4WD? I've a Chevy Colorado Duramax waiting for its 400 early next month. I am nervously reading these posts with a 2018 [email protected] 400 coming to our driveway soon. I have a straight six cylinder in a Volvo XC60 and am not going to make a move until I try it, but fear I will be making a move to a different TV. Having towed a larger trailer at an earlier time in our life, I have to agree with N7SHG_Ham that a larger TV makes this easier. Anyone towing with the RAM diesel? And Ford is coming out with one? One other observation - it seems the longer the wheel base of the TV the better the towing experience. I tow with a Ram Hemi, upgraded from a Frontier quadcab. The Frontier towed the 400 with no problem but it does tow and handle better with the Ram. I considered a diesel but when I did the math on the fuel costs it was a no brainer to stick with the Hemi. 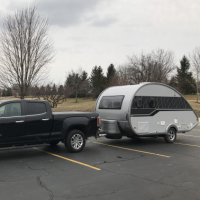 I get comparable to town and hwy mileage to the Frontier with the hemi and get 2-4 mpg better when towing [email protected] I don't tow anything larger than the 400. Now if I was pulling something over 7,000 lbs the diesel might make sense. Diesel here runs about 30% higher than 87 octane. 2011 Chevy Colorado inline 5, added electric trailer brakes. Tows our 400 great! 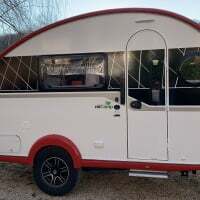 Tows smoother than our pop up did. I now tow my 400 with a GMC Canyon Denali CCSB Diesel. I got about 2200 miles towing so far in Utah, Nev, CA and AZ. Mostly at speed limits but for the 80 MPH in Utah, only doing 75 for the most part. Pulls the passes without breaking a sweat. But if above 65, my mileage does drop to 13's or so. At speeds below 65 I will see 17-19 again for the most part. Really depends on the terrain and traffic. No issue keeping up with the traffic on merging or pulling away from a light or stop. Plenty of power left over, rare to find a need to do a hard acceleration. I tow a 2008 [email protected] with a BMW x3. It does fine. I took it all the way from Colorado to California and back. Gas millage is not the best but that is expected. Since this floated back to the top, I will say a 400 has turned out to have a heavier hitch weight than many thought and the limiting factor on smaller tow vehicles may be that hitch weight. If your tow vehicle can't handle 500 pounds on the hitch EASILY it would probably be prudent to either not get a 400 or to upgrade to a bigger vehicle. 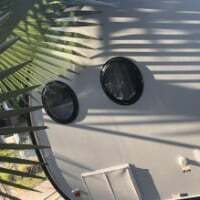 Unfortunately, I discovered the hitch weight issue after I had already purchased a 2019 [email protected] 400 Boondock Lite. (sigh) My tow vehicle is a 2015 Jeep Cherokee Trailhawk v6 with factory tow package. It can pull the trailer weight, but the tongue weight is over the limit. I love my Jeep so going to trade the 400 for a 2020 320s Boondock Edge. Ordered a black one with silver trim so will have to wait up to 12 weeks (hopefully less) to get it.